There’s no Easter without this traditional baked good in Germany. 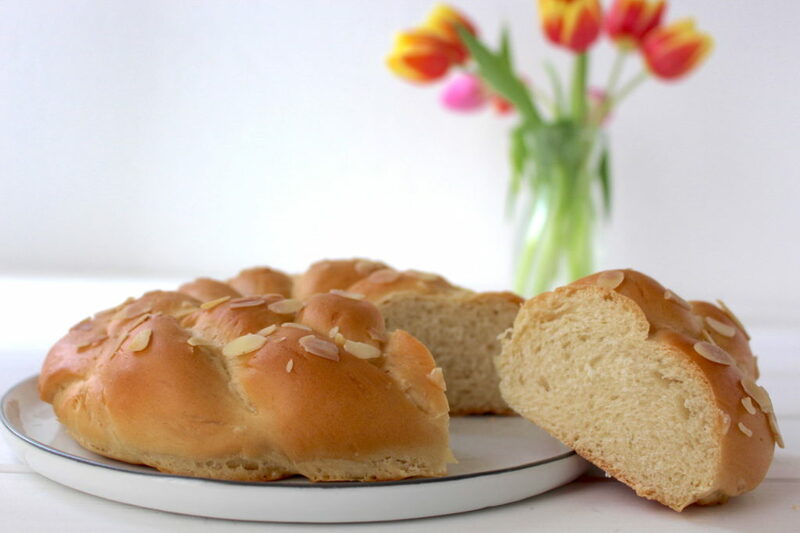 This braided yeast bread – made without eggs – tastes just like the original, if not better.. It’s very easy to make, you’ll just need a little patience to let the yeast do its magic. In the end you’ll be rewarded with a fluffy, lightly sweet and butter soft braided bread. Heat milk in a pot. Add margarine and stir until melted. Let cool until lukewarm, then add yeast crumbles and let dissolve completely. In a large bowl, combine flour, sugar, salt, vanilla and lemon zest. Add yeast milk and knead with dough hooks until a compact dough forms. Cover the bowl with a lid or kitchen towel and let rise for at a warm place (I usually cover the bowl with a blanket and put a hot-water bag next to it) for 1 hour or until dough has doubled in size. After resting, punch down the risen dough, divide in three parts and knead each third for a minute or so. Then roll into long snakes. Pinch the ends of the snakes together firmly and braid. Then again pinch ends together firmly. Cover with a kitchen towel and let rise for 30 minutes. Preheat oven to 360° F (180° C). 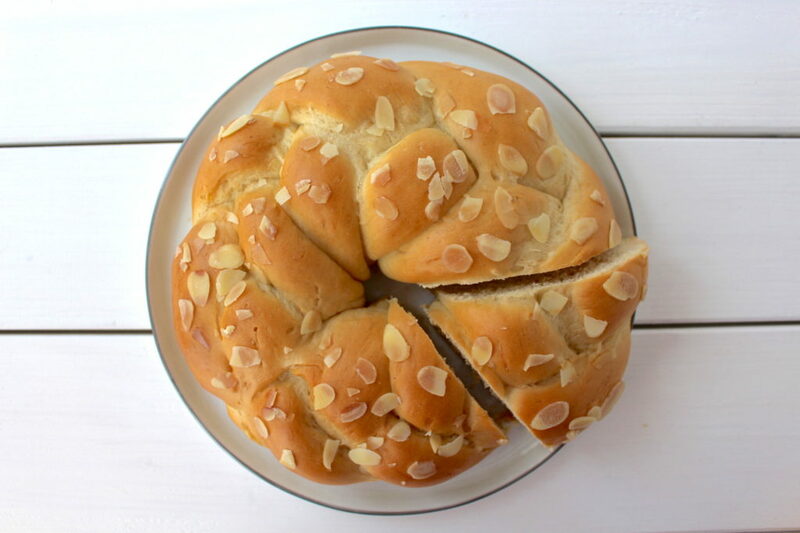 Brush a generous amount of plant milk over the braid and sprinkle with shaved almonds (or coarse sugar) if desired. Bake at 360° F for about 30 minutes or until golden brown. Enjoy with jam, vegan butter or as is. Keeps well, e.g. in a container for bread, for a few days. Instead of fresh yeast, you could also use dry yeast (adjust the amount). Traditionally, the braid is topped with coarse sugar. I hope you love this recipe – please let me know in the comment section below! 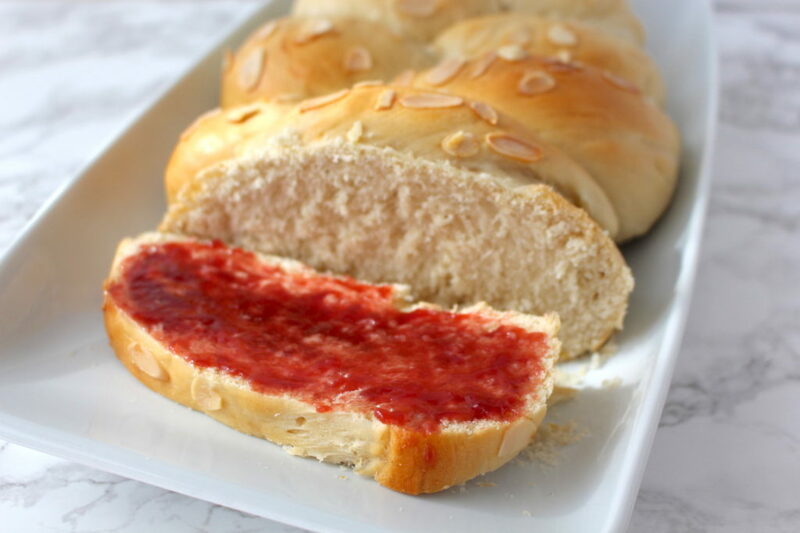 If you make this braided yeast bread, make sure to take a photo and share it on my Facebook page or on Instagram, using the hashtag #minamadefood. Oh and don’t forget to tag me (@thisisminamade) so that I can see your creations!